The decline in dehydroepiandrosterone (DHEA) due to ageing may be one reason behind increased cardiovascular disease risk in ageing populations, and this in turn may be mediated through inflammatory processes. We can expect many changes as we age, everything from declining hormone levels to elevated chronic disease risk; but what is the reason? And perhaps more importantly – is there a connection? A recent study, awaiting publication in the journal Aging Cell, contributed fascinating knowledge to the field by exploring just this question. Specifically, noticing a decline in serum DHEA concentration occurring alongside an increase in cardiovascular disease risk in ageing individuals, the authors investigated the relationship between these two variables and the mechanism through which this relationship may be mediated. In order to determine whether DHEA does have a role in arterial stiffness, and the mechanism through which it might elicit this control, the researchers administered 50mg of DHEA per day to male and female participants aged between 65 and 75 years. They then measured the carotid augmentation index (AI), the carotid-femoral pulse wave velocity (PWV) (both measures of arterial stiffness), serum hormone concentrations and several inflammatory cytokines. The authors reported a significant decline in AI and a non-significant decline in PWV in those treated with DHEA compared to placebo. Both the reduction in AI and PWV in the DHEA group were consistent with a reduction in interleukin-6 (IL-6), a multi-functional inflammatory and immune-stimulatory cytokine (for a great review read Mihara and colleagues 2012), and tumour necrosis factor-alpha (TNF-? ), an oft-mentioned inflammatory signalling molecule. Lastly, just to make sure these results could be attributed to DHEA, they verified that all of these changes were consistent with increases in serum DHEA. Taken together, these results suggest that DHEA plays a role in arterial stiffness, and may do so through anti-inflammatory mechanisms. This hypothesis has several implications: initial considerations are given to hormone support in ageing individuals – the impact of menopause and andropause on the physiology of every system cannot be underestimated; indeed supporting healthy hormone production may prove to be a very efficacious preventative strategy in the elderly. The second consideration is the importance of managing inflammation in ageing populations, which has implications ranging further than purely CVD management (see, for example, Prasad and colleagues 2012). In short, this is yet another study that shows it pays to think beyond the usual few nutrients generally prescribed for the management of a particular body system. Although improving nitric oxide production and lowering lipid levels are usually essential considerations in patients at risk of CVD, it is worth considering a more subtle and far-reaching treatment protocol, addressing everything from hormones to inflammation. Based on the Article Weiss, EP, Villareal, DT, Ehsani, AA, Fontana, L, Holloszy, JO 2012, ‘Dehydroepiandrosterone replacement therapy in older adults improves indices of arterial stiffness’, Aging Cell, Published Online Ahead of Print; June 19. 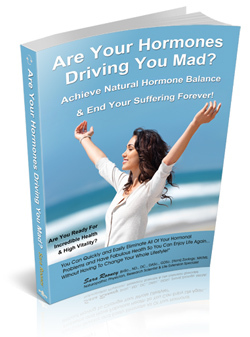 If you suspect your hormones are out of balance, contact our clinic so that you can receive personalised professional naturopathic health care to help you restore your health and vitality and give you back your life. References Mihara, M, Hasizume, M, Yoshida, H, Suzuki, M, Shiina, M 2012, ‘IL-6/IL-6 receptor system and its role in physiological and pathological conditions’, Clinical Science (London, England), vol.122, no.4, pp.143-159. Prasad, S, Sung, B, Aggarwal, BB 2012, ‘Age-associated chronic diseases require age-old medicine: role of chronic inflammation’, Preventive Medicine, vol.54, Suppl., pp.S29-37.